Policemen the world over are rightly assessed on how they act in the streets and it is the higher echelons in the Department who are held accountable for their performance and conduct. They are under intense fire in recent times for indiscipline, high handed or boorish behaviour, alleged involvement in politics and extra judicial activity. There is a need to change this for good. This is the view of many independent observers and the public in general. The government too is under tremendous pressure to improve the record of the police and punish those personnel responsible for heavy handed action, specially human rights violations. Following the establishment of the National Police Commission everyone imagined that law enforcement would improve. The more important reason why misconduct thrives within the Police is that many supervisors had lost the moral fibre to assert themselves vis-à-vis misbehaving policemen. A substantial number of senior officers have so many skeletons to hide that they can hardly assert themselves to move swiftly against errant subordinates. It was not long ago that the District Court of Colombo ordered the IGP to pay Rs.50,000 as compensation to a railway commuter who was attacked inhumanely in the course of a protest at the Fort Railway station. For the few who have been found out, there are many others who have escaped action. This is not a case of an isolated policeman on the rampage. Many more are possibly hiding themselves for the present and will display their fangs when the dust settles down on the recent happenings. I do not wish to mention anything about the Embilipitiya incident as it is being considered by a law court. Kid-glove handling of bad elements in the force has for long been the undoing of the police administration. There are two reasons for this. Departmental inquiries are a notoriously long-drawn out affair with inquiry officers rarely finding the time for a swift conclusion of the task assigned to them. The Police department should now think of establishing a separate wing of officers that will take care of departmental inquiries. Following the establishment of the NPC everyone imagined that law enforcement would improve. The Commission has not got off the ground as yet. It is still in its embryonic stage. There appear to be serious doubts about the effectiveness of the Commission. It is said that the NPC has no actual enforcement powers other than to recommend policy guidelines, promotions and transfers. In these circumstances no one should be surprised that power over the Police department will once again fall back on the political masters. What is the role of the Police in this formidable task of promoting respect for law. The minimum that we can ask for is that Policemen should themselves not break the law or even remotely abet such activity. Senior Police officers in the hierarchy have the sacred duty of themselves adhering to the law and ensuring that they indoctrinate those whom they supervise in the basics of ethics that governs policing. Some may complain that no other professions are as heavily scrutinised as the Police or held to such a high standard, but when one understands the nature of the profession it creates greater expectations. Only a transformation in the attitudes of senior Police officers can bring about improvement. Many of them take the easier way out, ignoring complaints of misconduct so that they are popular with their subordinates. A few do not also have the moral stature to deal sternly because some of them are afraid that their skeletons are likely to roll out even if well justified action is taken against a cantankerous subordinate. Sri Lanka has given effect to the UN convention against torture and other cruel and inhuman and degrading treatment by Act No.22 of 1994. Those who torture any person or attempt to commit , aid and abet or conspire to commit such an act can be found guilty under this law which carries a prison sentence of seven years and a minimum fine of Rs. 10,000. As usual pious promises are made by the police top brass and instructions are ostensibly sent to stamp out such displays of brute power but the people know that behind this façade brutality goes on. Those who are subjected to police torture are almost invariably come from the lower strata of society, who have no influential friends and relations on their side. If the very upholders of the law subvert and pollute the law, and if the authorities watch helplessly we could see more protests against the police which has become an almost daily occurrence now. We advocate a better deal for the policeman. For they work for long hours, in a stressful environment with little time for spending with their families. These cannot be dismissed as fanciful, nor can the factors driving such difficult working conditions be wished away. The way Police are organised in our country and the manner in which they are misused do not offer much hope that a turnaround is likely in the foreseeable future. However the frustration a Policeman feels does not excuse or justify in any way his barbaric treatment of people whom he come into contact with. When the very guardians desecrate the temple and violate the gods what hope can the average man have of fair treatment. There is an imminent need to correct the existing attitudes presently imbued in most police officers if the force is to be acceptable to the community at large. 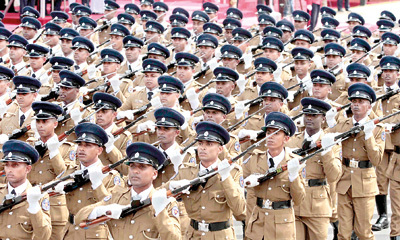 Over three decades back the Sri Lanka Police was a force that boasted of an extremely professional and ethical corps of dedicated officers who adorned senior positions. Let us honestly face the truth. The contributory causes for the decline are primarily political pollution of the police which has inundated and over run the service. A careful diagnosis of the viruses that affect this institution must be done and the causes elucidated and remedied.